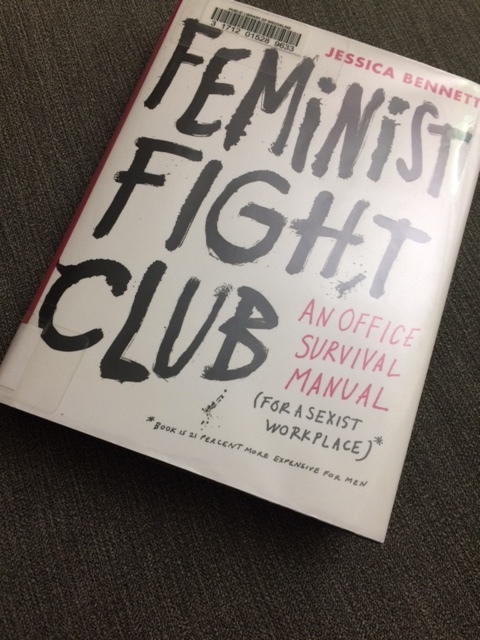 “This book is 21 percent more expensive for men,” Jessica Bennett quips in the opening pages of Feminist Fight Club: An Office Survival Manual for a Sexist Workplace. Her lightly sarcastic tone, coupled with Saskia Wariner and Hilary Fitzgerald Campbell‘s cartoonish illustrations, make for a read that’s the epitome of “serious fun” — full of encouragement, tips, and humorous insights into navigating a workplace where women are outnumbered. Bennett reflects on her own “feminist fight club,” a circle of female friends in their 20s and 30s in New York City. These women came from a mix of industries — TV writing, journalism, advertising, web development, documentary filmmaking — to meet for a shared meal and to commiserate about confronting sexism on the job. Describing the different types of figures one can expect to encounter at work, Bennett gives the down-low on everyone — the Manterrupter, the Bropropriator, the Mansplainer, and more — and ways to handle interactions with these folks. “Recognizing sexism is harder than it once was” (xxiii), she says, and in its subtlety, it can be more viperous than ever before. I’ve been lucky to work with some kind, supportive men, but I’ve also encountered these archetypes, and I know my friends have, too. (One of them dated a man who dared mansplain to all of us about feminism. Oof.) Surprisingly — or, perhaps, unsurprisingly, given the ingrained nature of sexism in our culture — these figures sometimes pop, like a jack-in-the-box, out of men we know and like. Throughout the book, Bennett reminds us women, “We fight patriarchy, not each other” (86), and calls attention to the ways that women, not just men, sabotage themselves. She bluntly outs the Impost-her, the Doormat, and the Credit Defaulter, among others. I had a somewhat out-of-body experience upon reading the description of the Contortionist — seeing myself, at my monitor, wrapping my right leg around my left, hunching over, playing with my hair — and cringed at the self-effacing image. Absorbing the profile of the Womenemy, I realized I’d also seen her before: The type of female colleague who disparages others, particularly fellow women, all the while publicly praising her male peers. This kind of woman fights her own battle, for sure, and I hope that those like her will read this book and benefit from it, too. Offering advice on everything from conveying confidence and refusing to be interrupted in meetings, to finding a mentor, to negotiation, Feminist Fight Club wraps up with ideas for starting one’s own FFC. It’s an incredible guidebook for women in a variety of male-dominated industries. However, the book did fall short for me in a couple of places. While FFC threw in some references to the additional struggles faced by women of color, I’d have liked to see more discussions of intersectionality and the role it can play in many women’s daily lives. Furthermore, while the book dedicated its last chapter (titled “A Penile Service Announcement (PSA)”) to advising men on ways to support marginalized women in their office, the question kept nagging in the back of my mind: How many men will casually pick up this book and read it? Of those, how many will read to the end? To all women (and men): Please read Feminist Fight Club. To the end.